According to Winrumors, you can take out a Windows Phone 7 device (they say various Windows Phone 7s on any carrier) with a single, solitary SMS message with a [redacted at request of Winrumors]. Worse (or better?) yet, it doesn’t have to be a text, it can be a Facebook message or Windows Live chat. 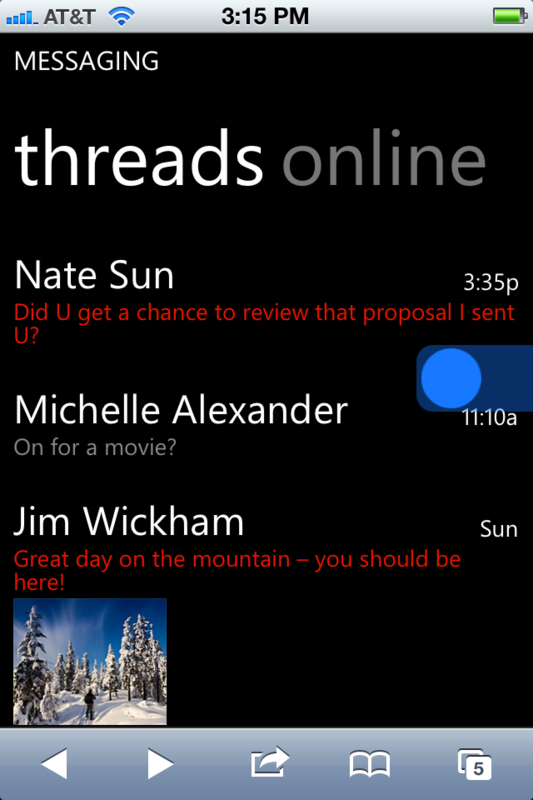 The flaw works simply by sending an SMS to a Windows Phone user. If the SMS contains a particular string of text then Windows Phone 7.5 devices will reboot and the messaging hub will not open despite repeat attempts. We have tested the attack on a range of Windows Phone devices, including HTC’s TITAN and Samsung’s Focus Flash. The attack is not device specific and appears to be an issue with the way the Windows Phone messaging hub handles particular characters. The bug is also triggered if a user sends a Facebook chat message or Windows Live Messenger message to a recipient. And you don’t just get a reboot. When your phone comes hobbling back to life, the Messaging hub no longer works. And other parts of the OS are wonky. If a user has pinned a friend as a live tile on their device and the friend posts a particular string of text on Facebook then the live tile will update and causes the device to lock up. The fix? Hard reset of the device. Ouch. With Apple deciding not to include support for T-Mobile’s bands in the US, T-Mobile has turned into an Android wasteland with over 90% of the smartphones sold on the network running on Google’s OS. Looking for some diversification (besides the over million legacy iPhones), T-Mobile looks to be one of the first in the US to roll out one of the new Nokia Windows Phone 7 devices which they plan to announce on Dec 14th, a little late for the holidays. Curious to see how Windows Phone feels, but don’t have a device around to do so? Us neither. But Microsoft has just released a new HTML 5 website that allows iPhone and Android users to get a taste of the Windows Phone 7 (Mango 7.5) operating system. The trial requires no downloads or registration, and you can try it out by just going to the webpage http://aka.ms/wpdemo on your mobile device. While it doesn’t use any of the data on your phone like your contacts, the demo does give you a pretty comprehensive look at all of Windows Phone’s features. Microsoft uses a blue dot to guide you around the operating system, and obviously some features like voice recognition just don’t work in the browser. Drat, that’s something we really wanted to try. Will this draw users over to the Windows Phone platform? Probably not, but it’s always cool to see what the competition is up to. Microsoft’s Craig Mundie shoved his foot knee deep in his mouth this week when he said that Siri was nothing special, and Microsoft’s own voice capabilities have been around for over a year. The reason for Siri’s success? Marketing, of course. People are infatuated with Apple announcing it. It’s good marketing, but at least as the technological capability you could argue that Microsoft has had a similar capability in Windows Phones for more than a year, since Windows Phone 7 was introduced. To be fair, Siri isn’t even about the Voice Recognition, it is what the iPhone does with it. The voice recognition is outsourced to Nuance’s engine. The Microsoft Phone barely made it to the point where you could make sense out of what its engine produced. If you were Microsoft, would you rather Mundie be so out of touch with the technology he is talking about that he can’t tell the difference, or that he’s just flat out shamelessly lying? Microsoft and Apple tackled touch interfaces in diametrically opposing ways. As Apple set out to bring multitouch on mobile devices to the masses with the 2007 release of the original iPhone, Microsoft created a blown up version with its Surface multitouch tabletop (which can now be yours for a cool $8,400, shipping in early 2012). Microsoft also progressed natural user interfaces with the Kinect motion controller for the Xbox 360 console while Apple charted its way into the future with an artificial intelligence-driven personal assistant dubbed Siri. So, when Microsoft’s chief strategy and research officer Craig Mundie sat down with Forbes’ Eric Savitz to talk the company’s planned expansion of the new user interface, he did what Microsoft executives typically do when challenged with a cool tech developed outside the Windows maker’s labs: He stuck his foot in his mouth over Apple’s groundbreaking digital secretary exclusive to the iPhone 4S.